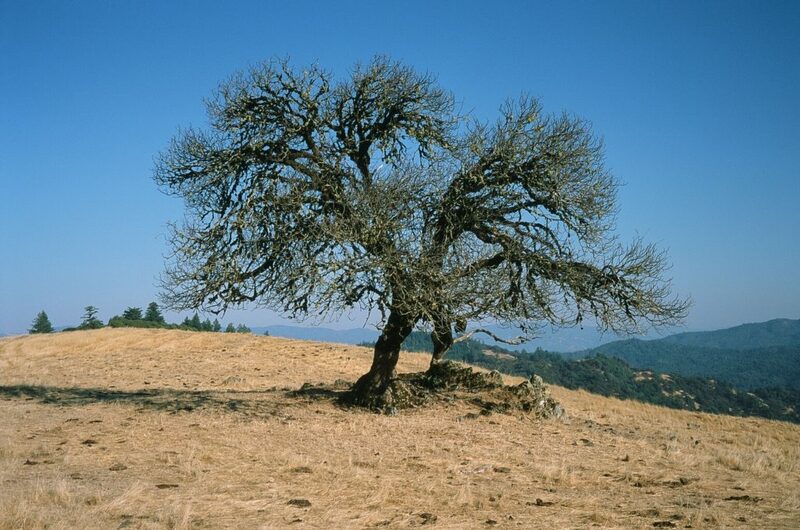 An oak along Orr Springs Road, in Mendocino County west of Ukiah. OK — a break from post-election stuff. For my birthday earlier this year, one of my kids gave me what probably qualifies as an antique film camera. It’s a Canonet — a little rangefinder camera made by Canon in the mid-1960s through the late ’70s. I haven’t shot any film in years, and while the camera is fairly simple to use, I had no idea how pictures would come out. After ruining a couple rolls that I apparently failed to advance or rewind correctly, I finally managed to shoot some color slide film, extract it from the camera, and get it processed. The results are fun and gratifying — here’s a Flickr slideshow of images that the lab digitized and transferred to a CD. I’m ready to go out and shoot more. 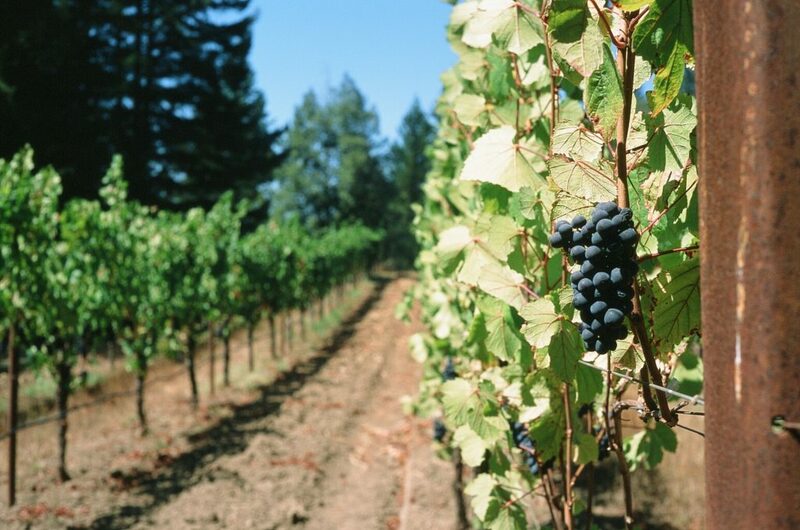 Pinot noir grapes, Toulouse Vineyards, Mendocino County. Here’s a story that made the rounds in the midst of this week’s unpleasantness: a piece from the CBC on a township in the southwestern corner of Manitoba that offers cheap house lots for those willing to build there. Well, the story isn’t really about the township — the Rural Municipality of Pipestone. It’s about a half-dozen calls the municipality got from Americans in the days after the election asking about the lot purchase program. Try as I might, I can’t find details about the lot sizes or locations (yes, I’m curious). But the RM of Pipestone website lays out the deal: You put down $1,000 for a lot, with the promise to start building on it within 12 months, and you get $990 back when your dream house on the prairie is finished. You get a little bit of the flavor of the community from one of the local papers, the Reston Recorder (the online edition is a little out of date). This is oil country, just north of the North Dakota border. On the plus side, the Rural Municipality of Pipestone was in the news a few years back for using some of the oil revenue it’s getting to fund a annual $500 grants for residents. The municipality is also funding the $10 lot program with its oil windfall. Some have seen a downside. In addition to the wear and tear on local infrastructure — shades of what’s been seen south of the border — there have been complaints in the area about oil spills and provincial regulators’ failure to take action. Anyway, you would-be Trump exiles, that’s waiting for you north of the border. I’ve got my own little Great Plains rural fantasy — Benkelman, Nebraska — and was wondering how the elections went there. Among Benkelman’s many claims to attention, beyond the fact I drove by in 2007, is that it’s the birthplace of Ward Bond. You know — the actor. “Wagon Train.” Sergeant Tom Polhaus in “The Maltese Falcon,” the character who sets up Humphrey Bogart’s last line. The town’s in southwestern Nebraska, in Dundy County along U.S. 34 near the Colorado line. So how did the county vote on Tuesday? Of 949 votes counted in the presidential contest, Trump got 823, Clinton got 89, Gary Johnson 31, and Jill Stein 6. I would like to meet the Stein voters in Dundy County. The region’s Republican congressman ran unopposed. He got 841 votes. Tammy Buffington won the race for Benkelman’s East Ward City Council seat. No one ran to represent Upper Republican Natural Resource Subdistrict #1. The village of Haigler, which claims to have been the home of the first female postmaster in the United States, saw a dramatic contest for town board. Jolene Brunswig got 43 votes and Rick Starks 41. Reflecting a little on what’s happened this week, and on this very disturbing piece of business here — an interview with the most straightforward, thoughtful, well-spoken white supremacist you’ll ever encounter, and all the more disturbing for that — it occurred to me once more how eager our white society has been to put its grossest transgressions in the rear-view mirror and act as if, now that we’ve resolved that little problem to our own satisfaction, everyone should move on. Nothing to see here, folks, but lots of unpleasantness we can just leave behind. What’s the difference between you and the racists that like, you know, hung people up from trees? What’s the difference between you and the Klansmen that burned crosses on peoples lawns? What’s the difference between you and you know, the people who don’t look at me, an African-American man, as a full human being? I’m sure there is some commonality between these movements of the past and what I’m talking about. But you really have to judge me on my own terms. Like I am not those people and I don’t fully know, I don’t know in the specifics of what you’re referring to. Like I am who I am. And you, if you’re going to treat me with good faith, you have to listen to what I’m saying and listen to my ideas. I think someone who would go down the path of becoming a Klansman or something in 2016, I think that is, those people are very different than I am. It’s, it’s a it’s a non-starter. I think we need an idea. We need a movement that really resonates with where we are right now. This isn’t really a new idea, as he says. He points to Israel as such a state. But of course there’s an example much closer to home — in fact, a state founded on the very same principles of white supremacy that underlies the idea of white nationalism. Many of us treat the Confederacy and the Civil War and the long siege of Jim Crow that followed as objects in the rear-view mirror; curious, glorious or shameful objects that have receded almost from view. Let them stay in the past. And it was beyond humans, Lincoln said, to understand what price providence might demand for the crime of slavery. It was beyond us to know when the debt had been redeemed. “‘Woe unto the world because of offenses; for it must needs be that offenses come, but woe to that man by whom the offense cometh.’ If we shall suppose that American slavery is one of those offenses which, in the providence of God, must needs come, but which, having continued through His appointed time, He now wills to remove, and that He gives to both North and South this terrible war as the woe due to those by whom the offense came, shall we discern therein any departure from those divine attributes which the believers in a living God always ascribe to Him? I think the first time I encountered the address was at the Lincoln Memorial, where it’s inscribed in marble. That passage — “until all the wealth piled … until every drop of blood drawn ” — has always stuck with me. First, I think, because of Lincoln’s sober consideration of the magnitude of the “offense” that had led to the war. Second, because of his suggestion that there was no way of knowing when the nation’s offense would be expiated — or even whether it could be expiated. And third because, even though I am not one of Lincoln’s faith and I don’t imagine an omnipotent deity who wills human cruelty and then doles out punishment for it, the renewed encouragement of racial hatred we’re seeing now makes it clear that we’ve yet to really reckon with the worst chapters of our history — slavery, Native American genocide, the Klan’s reign of terror, Jim Crow, mass incarceration. And now, it seems, we’re listening to people who are eager to write the next dark chapter of history.